If you use Outlook in your everyday work, sharing its folders between different computers can completely change your working experience and increase your overall productivity. Now, synchronizing Outlook between 2 computers has become a lot easier than it was before. This is because our popular Outlook sharing plugin, CodeTwo Outlook Sync has just become a free tool. No trial period, no ads, or strings attached. Simply download it and enjoy its benefits for free! What is CodeTwo Outlook Sync? There are many programs and add-ins designed to make Microsoft Outlook more powerful than it already is. CodeTwo Outlook Sync belongs to this group, but it certainly does stand out in the crowd. Why? Because it is the most powerful application allowing to synchronize Outlook between two computers in real-time. And now it’s completely free! 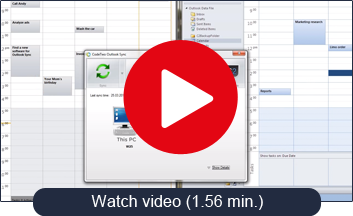 Sync your laptop and PC so that they are always up to date. Even when you take your laptop away from the local network, all the data will be updated as soon as the machines connect to the same local network. Share data between different email accounts. You can easily plan meetings for a co-worker and manage a shared calendar. Managing your boss’s schedule could not be easier! Backup all important information to another computer, so that you can restore it when needed. Share all mailbox items with your teammate, so that you can cooperate like a single organism. You can, for example, get the same emails and know which emails are already answered. You can also share schedules and tasks to know your availability and track progress of your work. With the latest release, CodeTwo Outlook Sync becomes completely free. It has no longer a free trial – you can use it for how long you want with all its features unblocked. CodeTwo Outlook Sync is a perfect solution if you need to sync Outlook between two computers. If you need to sync more computers, check out CodeTwo Public Folders. It can sync many users at once, comes with an easy to use File Sharing App, and is not limited to local network. You can download a free 30-day trial to test its functionality. We are using CodeTwo Outlook Sync between 2 office PCs (for the calendar/contacts in Outlook 2019). We can sync our calendars fine, but cannot sync our contacts. One PC has about 80, the other almost 2k(!). Thoughts? What if I want to sync two different computers on different servers with the same outlook email? I am trying to use Code 2 Outlook Sync to sync my outlook files between my laptop and my desktop. I have installed the software on both machines and have started a sync session for the files. On the advanced tab I have checked the “Launch at Windows Startup” checkbox. I dont believe that the program is working properly because it does not seem to be launching at Windows startup. If I log into my account on the computer…then the two computers will sync….but as soon as I log off the connection between the computers is dropped. What am I doing wrong…or dont I understand the when the checkbox “Launch at Windows Startup” does? I thought this meant that the program launched at startup….but apparently does not. Can you please explain this to me…or do I need to buy the professional version? CodeTwo Outlook Sync synchronizes Outlook clients. Therefore, it requires Outlook to run on both computers. If you choose to launch the program at startup, it launches at startup, and synchronizes Outlook clients as soon as both are online. Hi. I need to sync my desktop with my notebook which I take out for meetings and travelling. CodeTwo Outlook Sync can help you with that. Even if your Outlook downloads an email without leaving the copy on a server, Outlook Sync will synchronize all elements. By default, the program works in a local network, so the sync occurs when the two machines with Outlook connect to the same LAN. However, there is a workaround which allows you to sync Outlook over the Internet. We synced two computers but the calendar which has appointments for 6 different people didn’t sync. We don’t have a microsoft server, we are using etisalat server can we still use this programme to sync calendars on both computers? The program does not require any specific server to sync Outlook. Mind that, by default, the software works in a local network; however, there is a workaround which allows you to sync Outlook over the Internet. I have downloaded Code Two Outlook Sync on my desktop and laptop. Everything (almost everything) syncs OK, however, the tasks don’t sync? Whys is this so? CodeTwo Outlook Sync should sync tasks without any issues. Check the Sync options to ensure the program is set up to synchronize tasks. Which software version will sync my desktop outlook that holds 4 different email addresses, plus contacts, plus task list? When I am at my home office, I use my big laptop, but when I travel, I take my surface pro. I would like to be able to access my task list, 4 email accounts (with subfolders), and contacts on the surface pro while I’m traveling. Is there a way to do this? I use office 365, but their web interface doesn’t do tasks or sync/update in real time. It’s useless to me. I’d love to try this, but I need the internet part of the “Public Folders” product, but only have 1 desktop and one laptop. I need to sync across the net. Is there a smaller version of the Public Folders or a small upgrade to the Outlook Sync? CodeTwo Outlook Sync does not offer a way to sync over the Internet and the smallest package for CodeTwo Public Folders is for syncing three devices. As a workaround, you could use CodeTwo Outlook Sync and connect your computers using a VPN tool. Consult this article for more information on how to use CodeTwo Outlook Sync over the Internet. Can you sync multiple accounts? I selected all folders but it only syncs 1 account. Sorry, but the tool syncs only one Outlook account from each computer. It can be the same or a different account, but the program will only let you synchronize the primary account. To share data between more accounts, you would need to use CodeTwo Public Folders. Not true. the simple version with features that can be done manually without the need for a software is free, for sure. but if you are looking to (automatically) synchronize all folders and perhaps more advanced features, the version is VERY EXPENSIVE!!! it is $160 versus using other competitors that cost a fraction of the cost. It seems that you have mistaken two different products. The software that has recently become a freeware is CodeTwo Outlook Sync, which enables to synchronize all (or chosen) folders between two (2) Outlooks automatically. This feature is not available natively. The cost you mention is taken from the CodeTwo Public Folders pricing site. CodeTwo Public Folders is a different product, which I mention at the end of the article, and which is not free, but for a reason – it is much more powerful and can sync up to 150 computers. expensive and requires annual renewal. not recommended! CodeTwo Outlook Sync is completely free and even before it became a freeware, it never required renewal.